In the densely populated outskirts of Harare and Chitungwiza, ROKPA supports more than 600 families that are caring for children with disabilities. 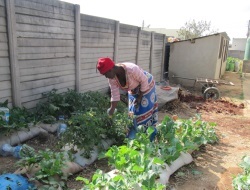 Training workshops are held on gardening to encourage self-sufficiency in growing fruit and vegetables. This includes topics such as mixed cultivation, pest and disease control, improving the soil and techniques for water retention. In addition, information is conveyed about healthy nutrition and preparing food. During recent years, economic and social changes have brought about great poverty. Due to ongoing increases in the cost of living and the breakdown of the health system, survival is becoming more and more difficult. Children with disabilities are disadvantaged in multiple ways: discriminated against for food and lodging and they have no access to education, healthcare or leisure activities. Birth registration, integration and information are denied to them. In addition, mothers of children with disabilities are usually left by their partners, since the common belief is that a disability is the result of infidelity. The ROKPA project 'Low Input Gardening' supports mainly for parents with kids with disabilities. Help a family become self-sufficient!